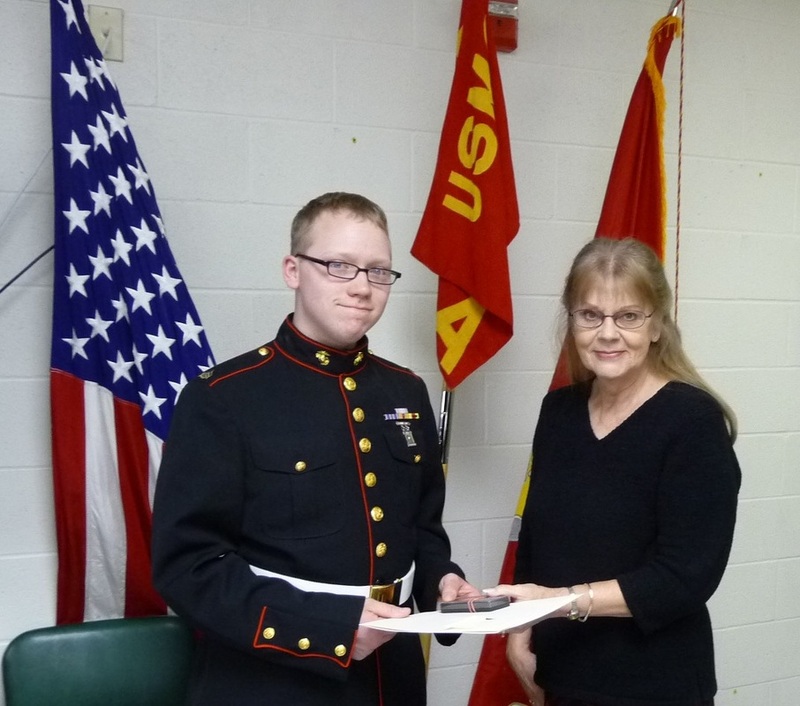 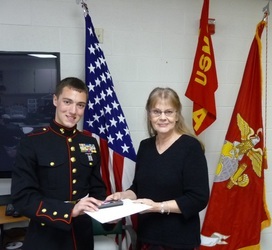 Sandra D. from Lt. George Farragut Chapter presented a check for $500 to the Kootenai County Veterans Council to help bring the Vietnam Traveling Memorial Wall, a 3/5 scale of the Vietnam Memorial in Washington, DC, to Hayden. 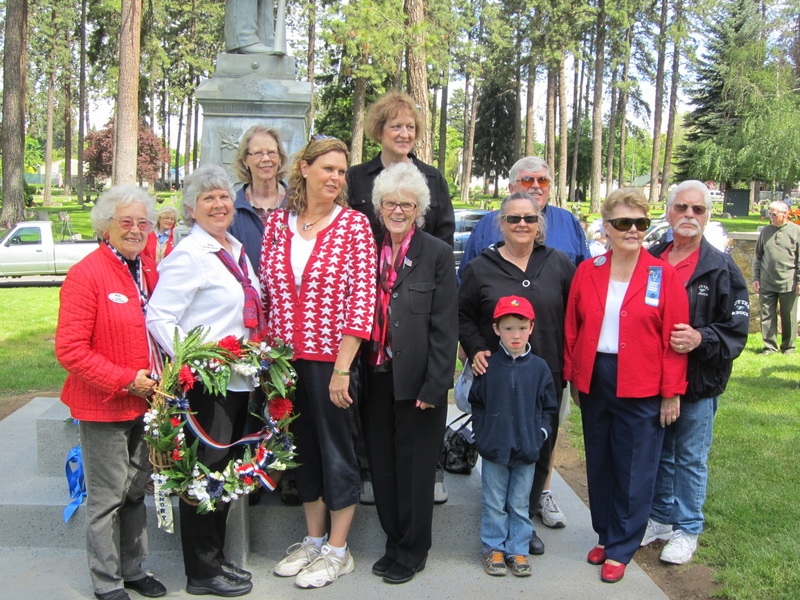 The wall stands six feet tall at the center and covers almost 300 feet from end to end. It serves as a reminder of the great sacrifice made during the Vietnam War. 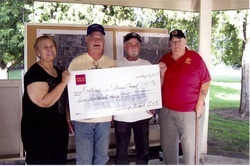 Funds from our Applebee's fundraiser were used to support this event. 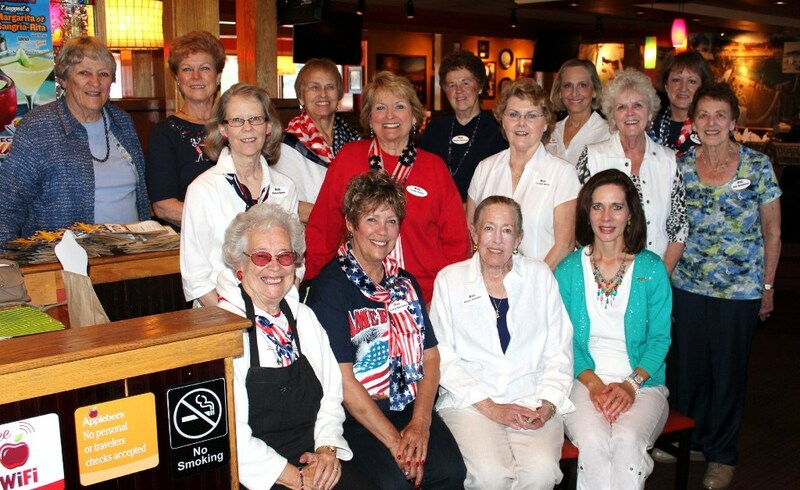 Our first Texas Roadhouse Fundraiser exceeded our expectations! 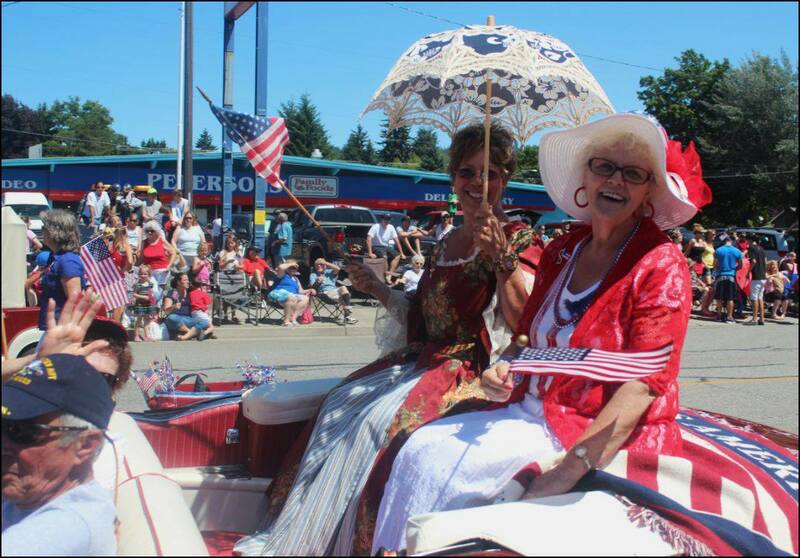 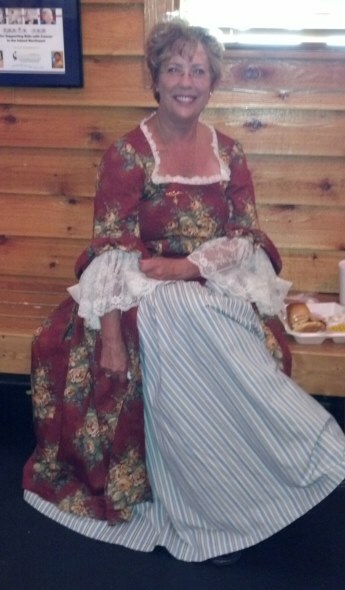 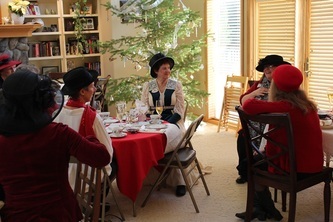 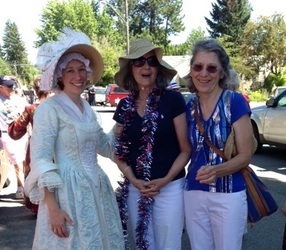 Chapter members Cheryl, Lorri and Sandra C. donned Revolutionary-era costumes while Lora greeted guests. 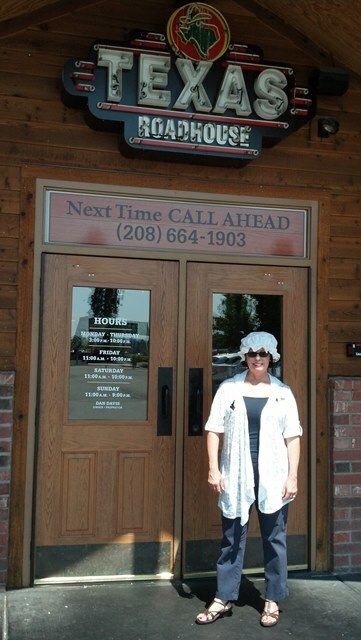 Texas Roadhouse offered sack lunches with a pulled pork sandwich, corn, coleslaw and a fresh baked roll with honey-cinnamon butter. Two hours and nearly 60 sack lunches later we had earned $400 for our chapter. 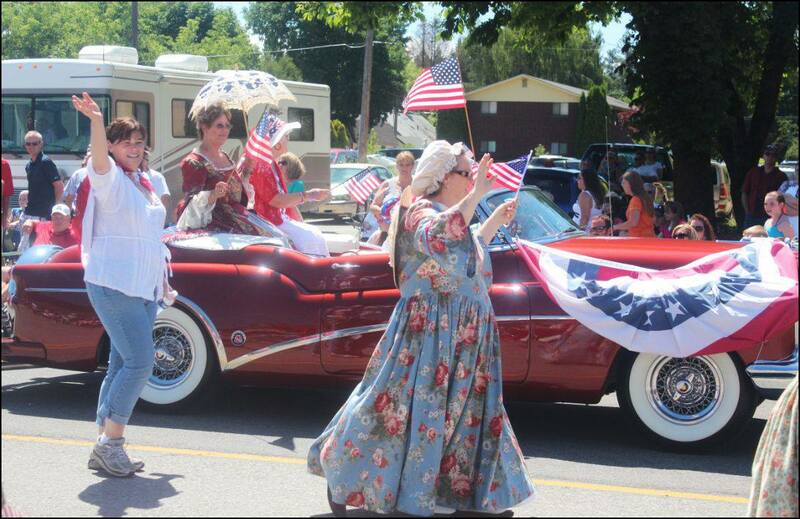 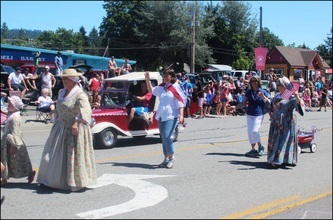 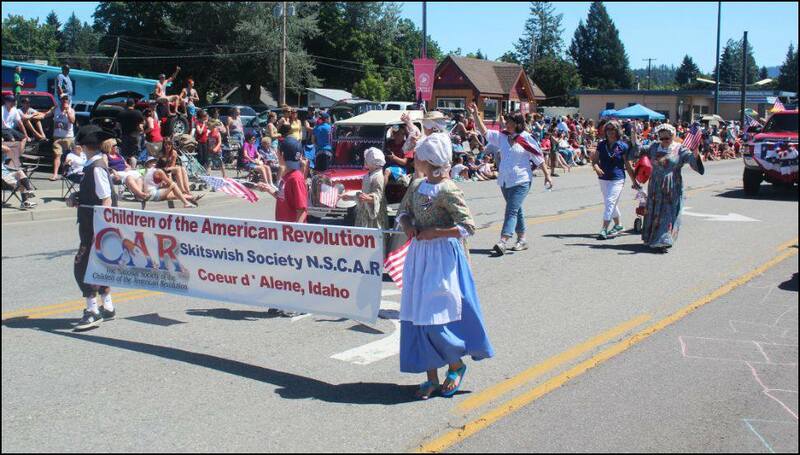 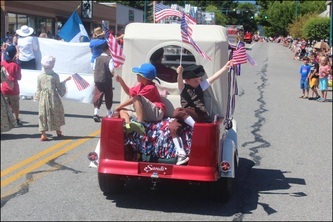 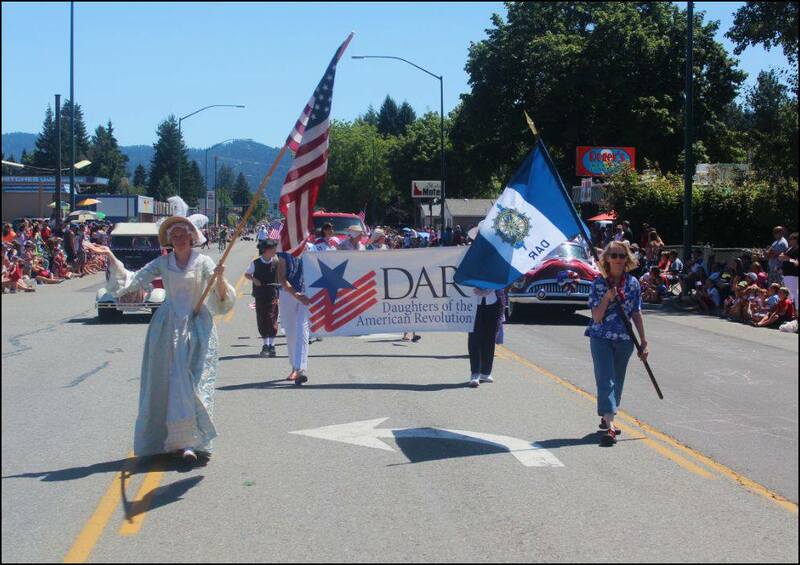 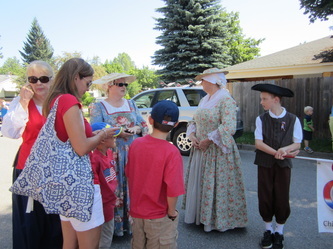 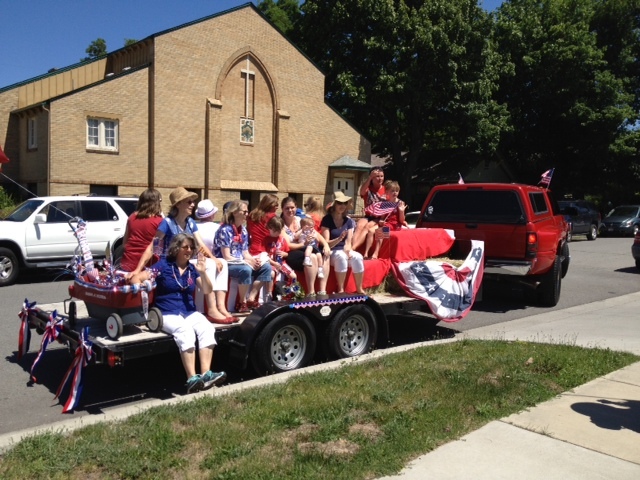 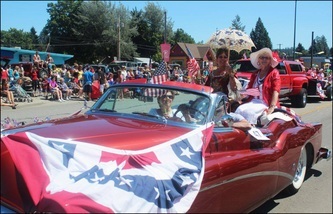 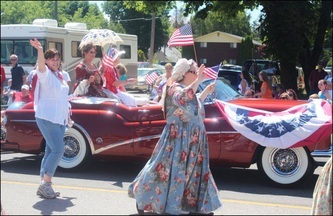 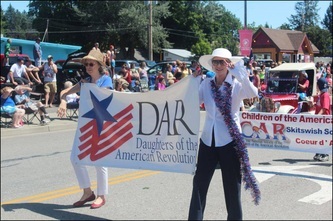 Lt. George Farragut Chapter members were accompanied by the Skitswish Society of Children of the American Revolution in the 4th of July parade. 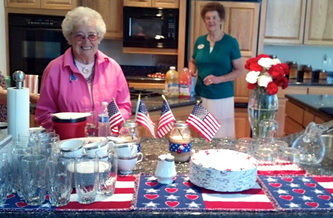 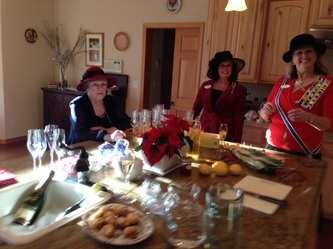 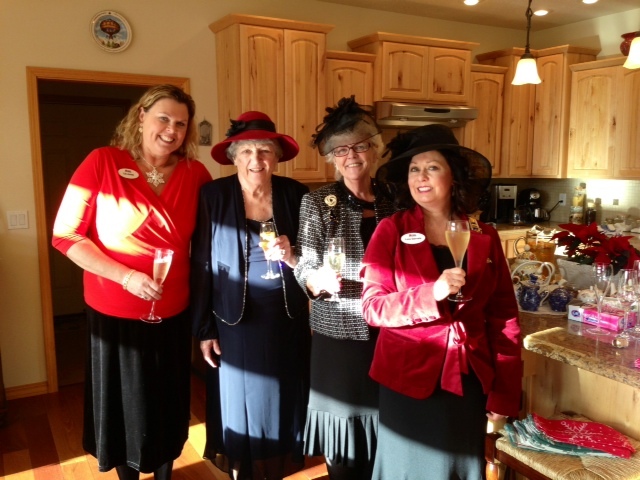 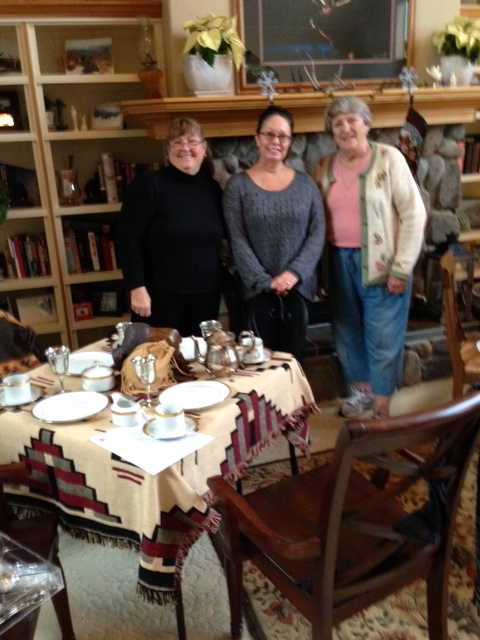 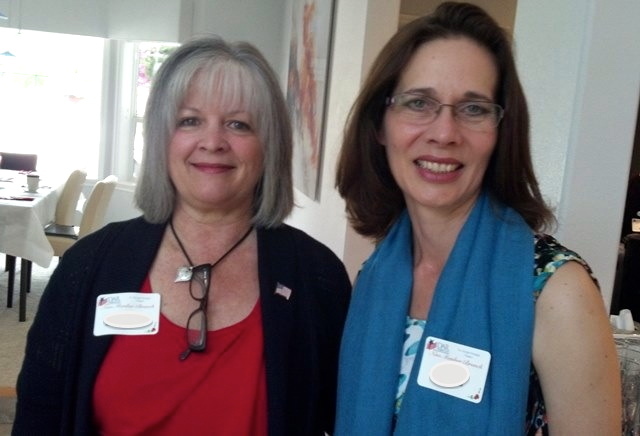 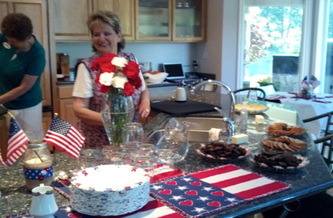 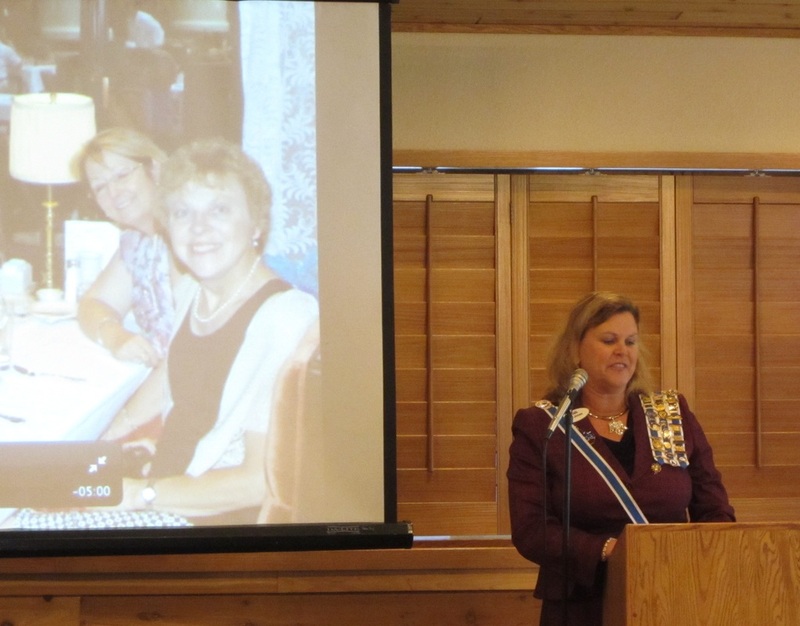 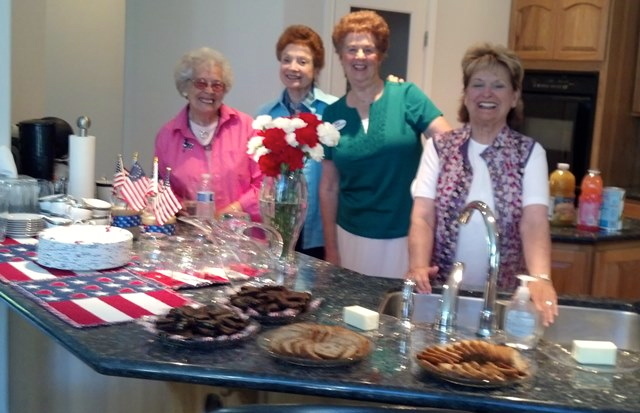 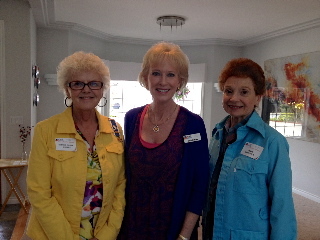 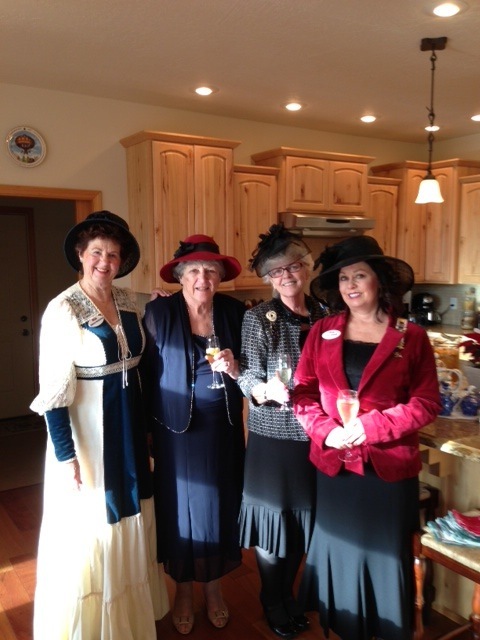 Louisa D., Luella S. and Jeanne V. planned and hosted Lt. George Farragut's first annual New Member Brunch at Vice Regent Luella's beautiful home in Coeur d' Alene. Past Regent Dorothy B. shared her thoughts on being a member of DAR. 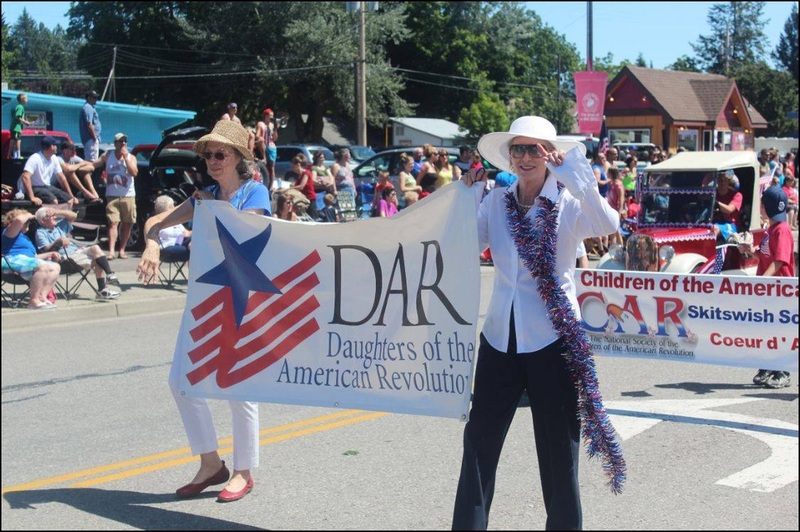 New member Cheryl M. read an inspirational reflective writing on "What DAR means to me." Lt. George Farragut members greeted, served, bussed, washed dishes and more at a fundraiser to earn money for three veterans projects: Inland Northwest Honor Flight, Traveling Vietnam Memorial Wall and DAR's Project Patriot. 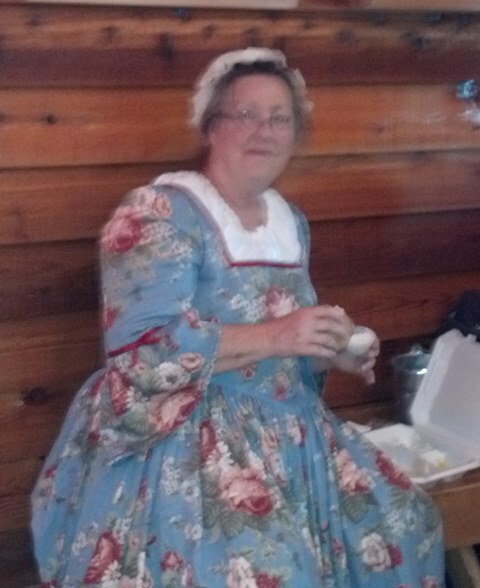 Over 150 breakfasts were served by our friendly crew. 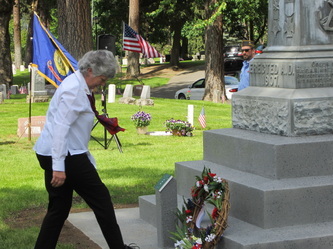 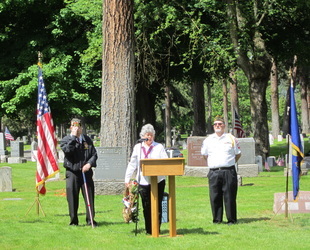 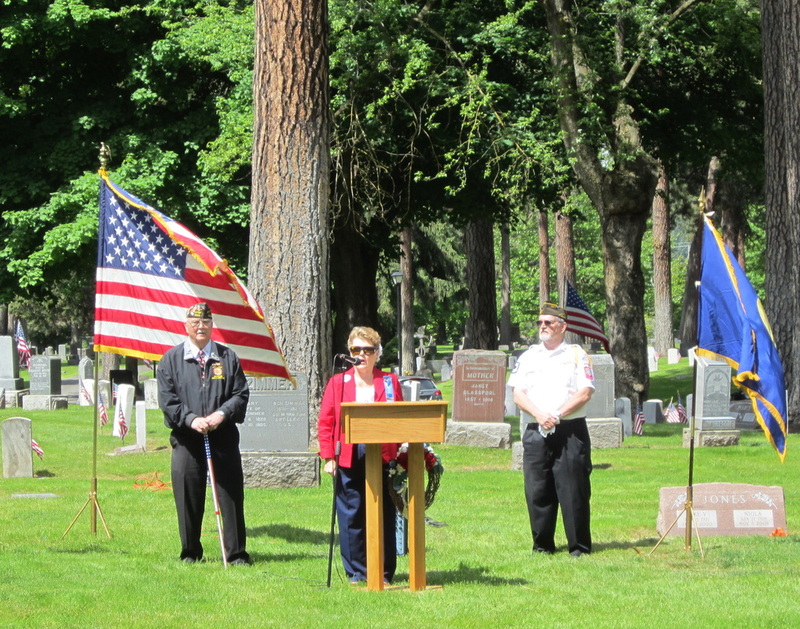 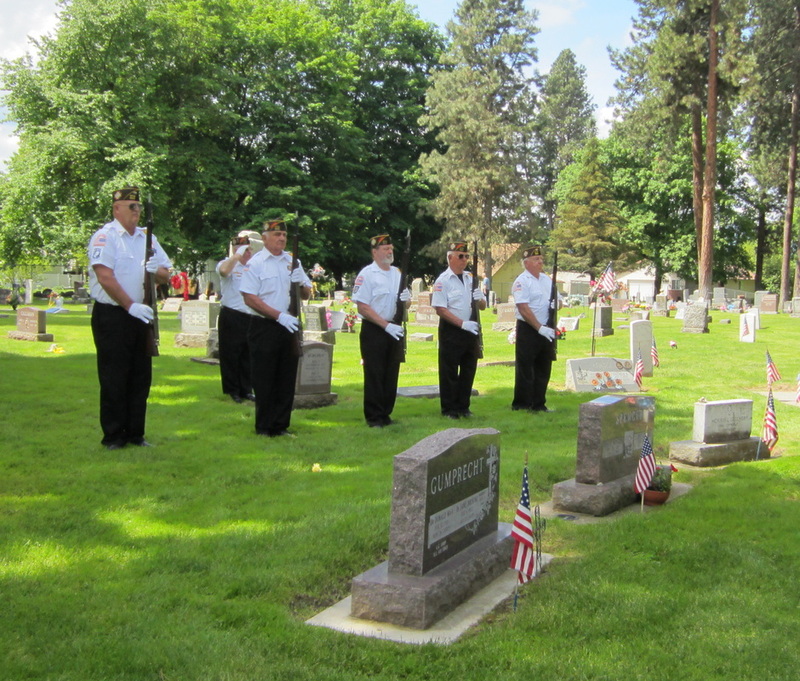 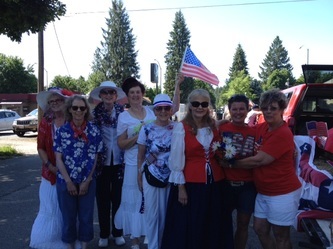 Lt. George Farragut Chapter members participated in the Memorial Day ceremony at Forest Cemetery in Coeur d'Alene. Chaplain Dorothy Benoit spoke and presented our chapter wreath. 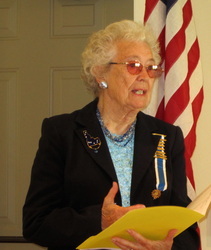 Chapter member Chickie also represented a group for World War II orphans. Our chapter met at the Jacklin Arts and Cultural Center in Post Falls where Acting Executive Director Shaina Nomee shared the history of "The JACC" and talked about the current Native American exhibit featuring the work of Melissa Cole whose style is vividly colored, heavily textured and patterned acrylic paintings. 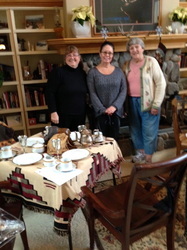 We were delighted to hear that some of Shaina's relatives have attended Chemawa Indian School that our chapter supports. 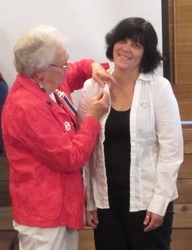 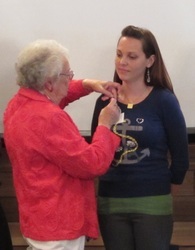 Krista W. took the oath of membership. 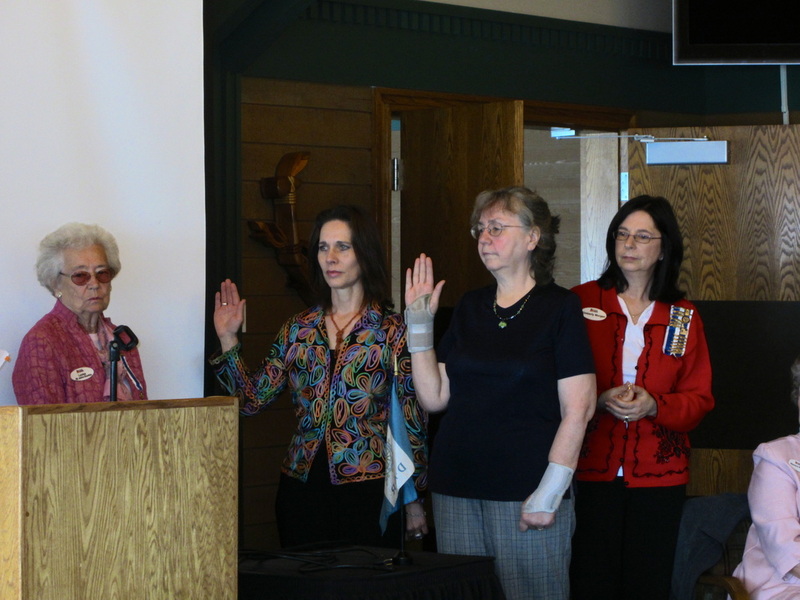 Four of our 2013 - 2015 officers were present and installed. 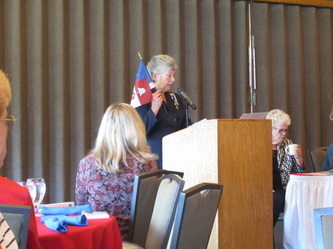 While others were at State Conference, chapter member Lita K. traveled to Kellogg High School for an awards ceremony where she presented the DAR Good Citizenship medal to one student and the ROTC award to another. 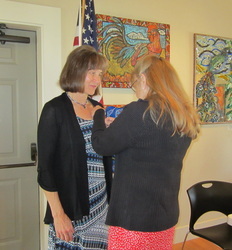 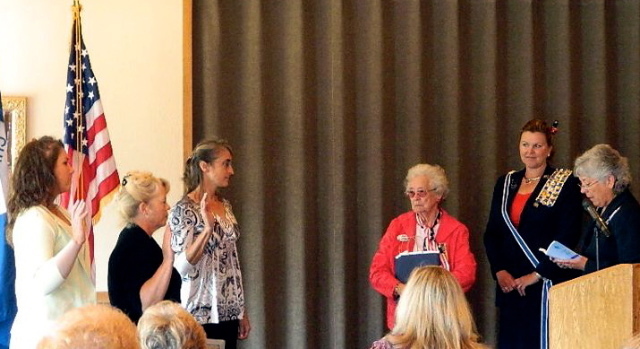 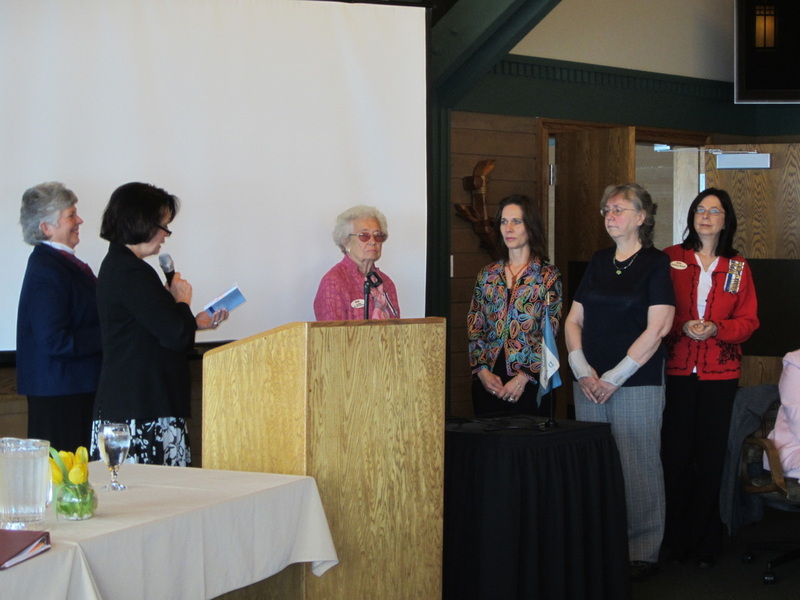 New members Robin K. and Susan C. took the oath of membership in a ceremony presided over by Registrar Louisa Durkin, Vice Regent Lora Gervais, Chaplain Dorothy Benoit and Recording Secretary Kimberly Morgan. 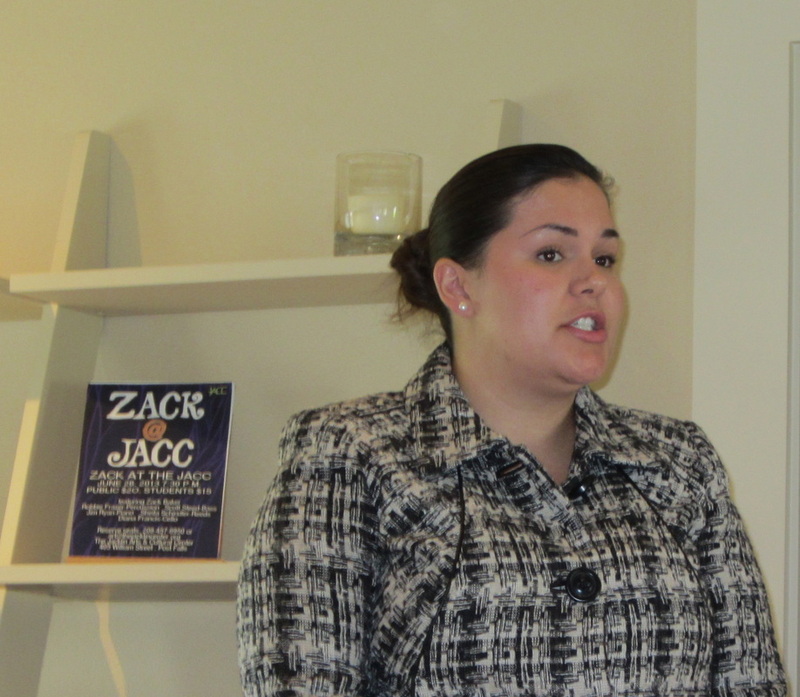 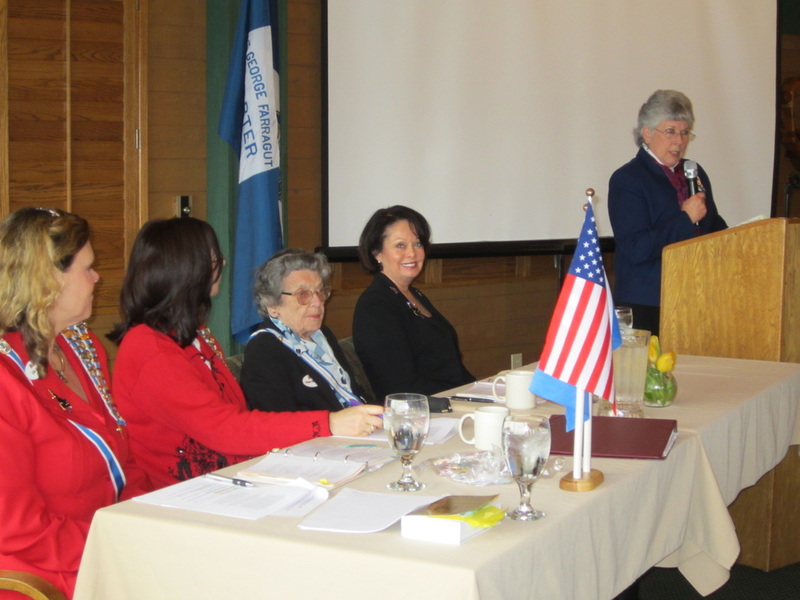 State Regent Liz Jones shared what to expect at State Conference next week and answered questions from the floor. 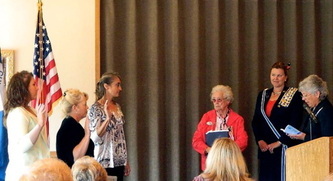 Jane and Martha presented the slate of officers for the coming year. 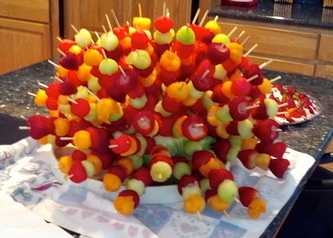 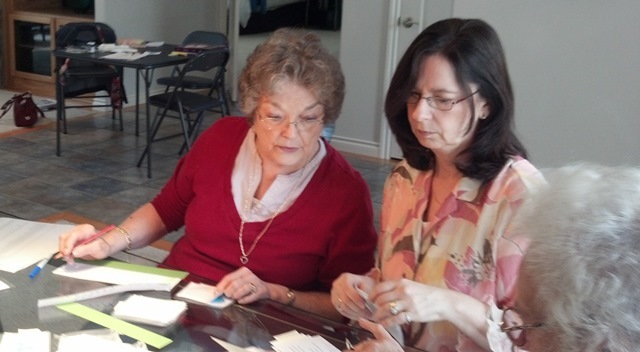 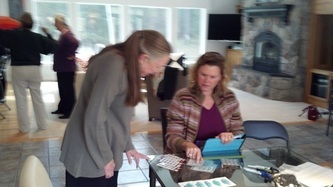 With our state conference just around the corner, several ladies gathered at Lue's home to work on loose ends. 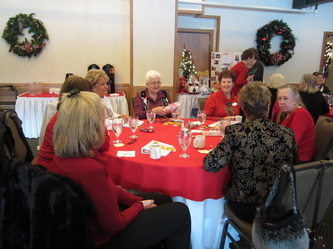 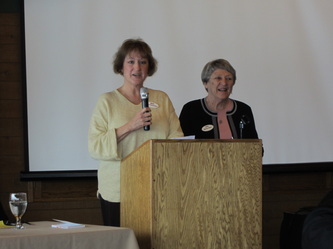 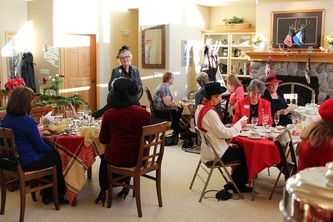 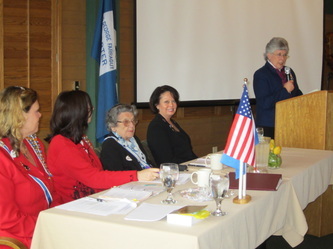 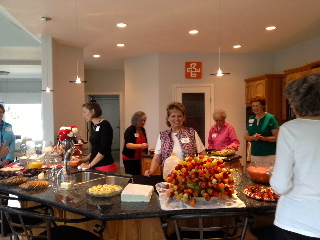 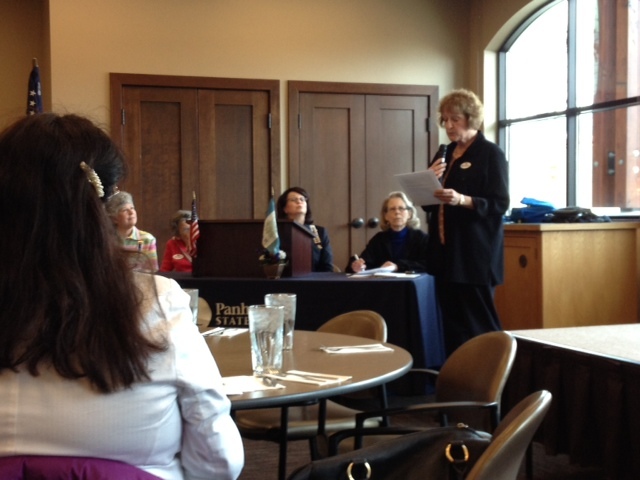 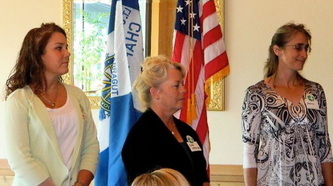 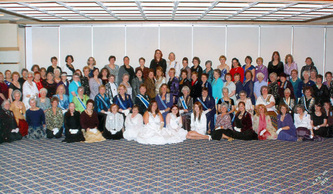 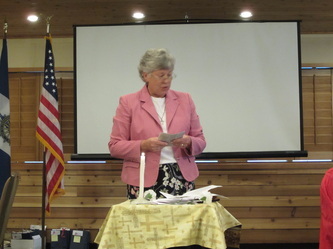 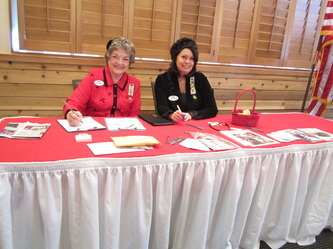 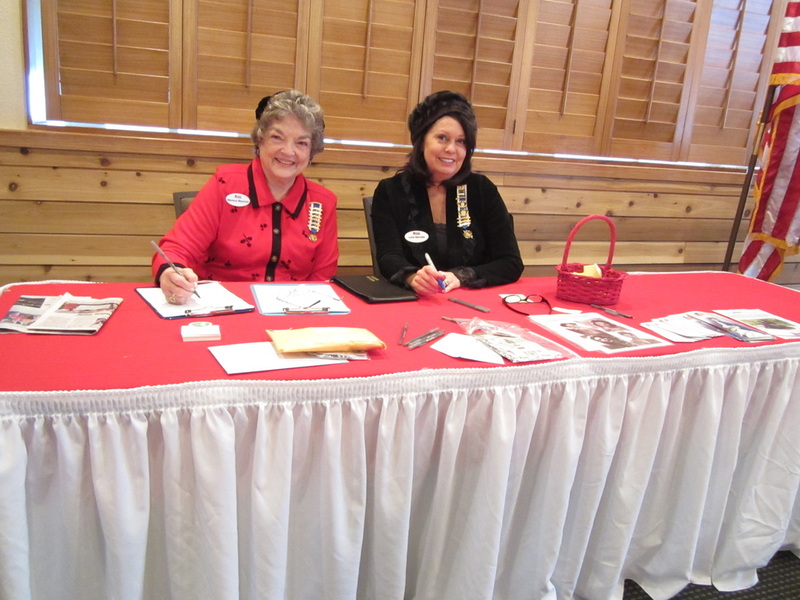 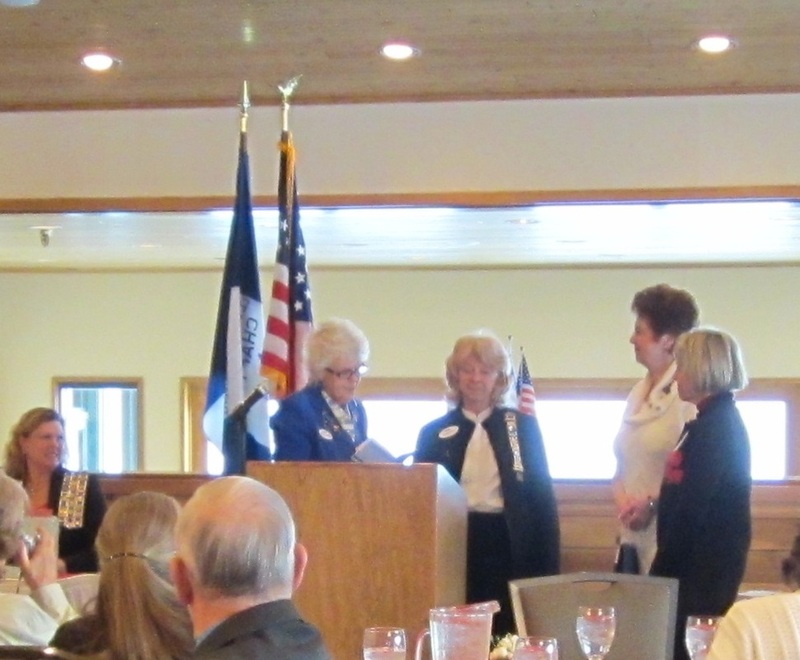 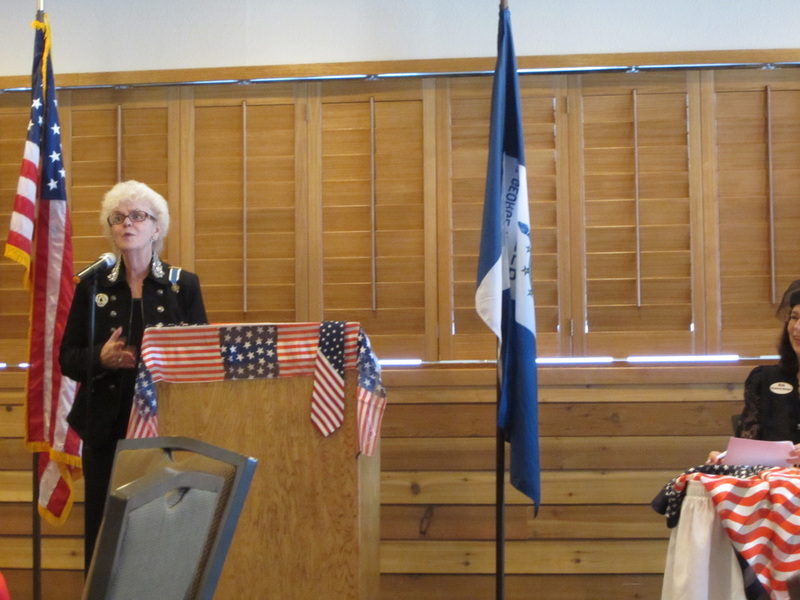 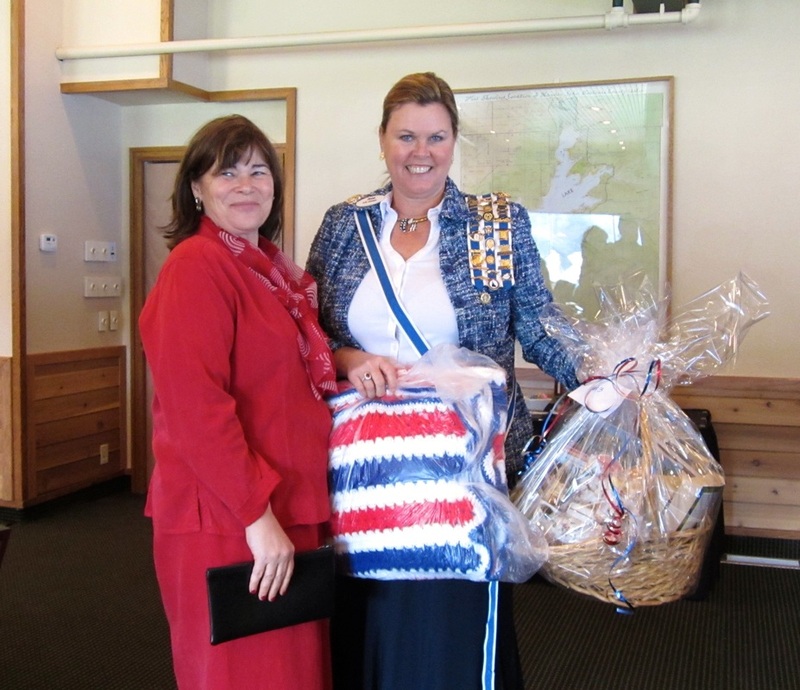 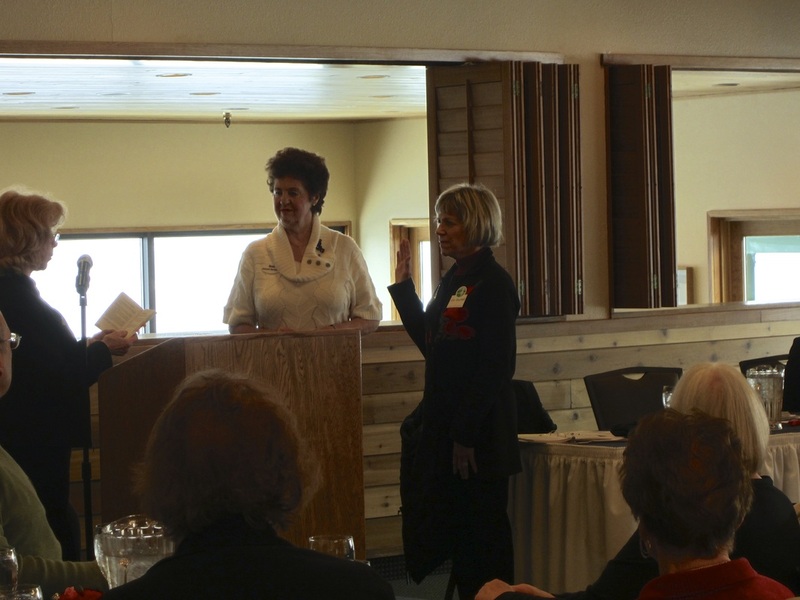 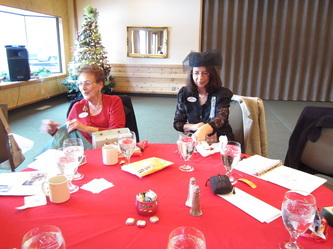 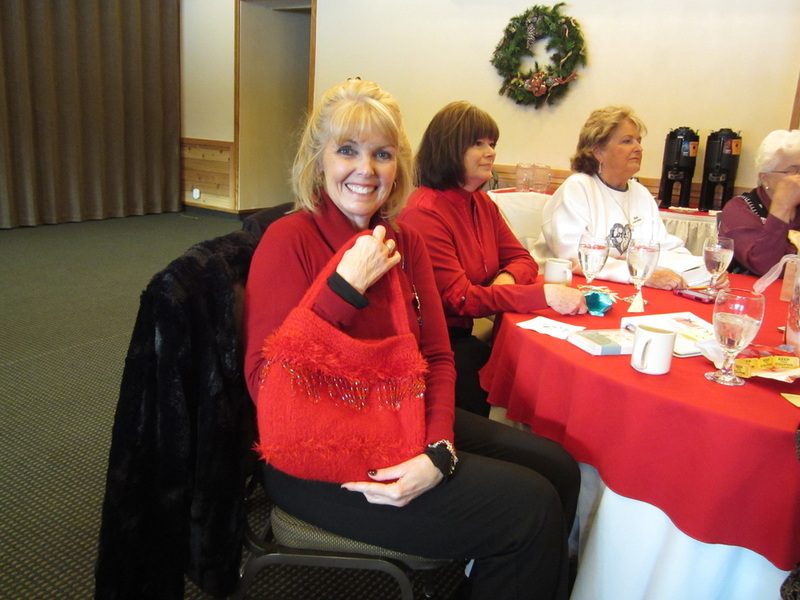 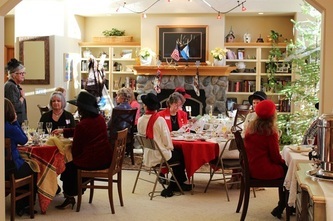 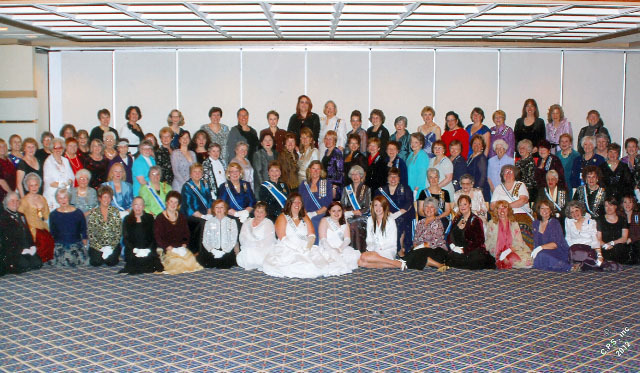 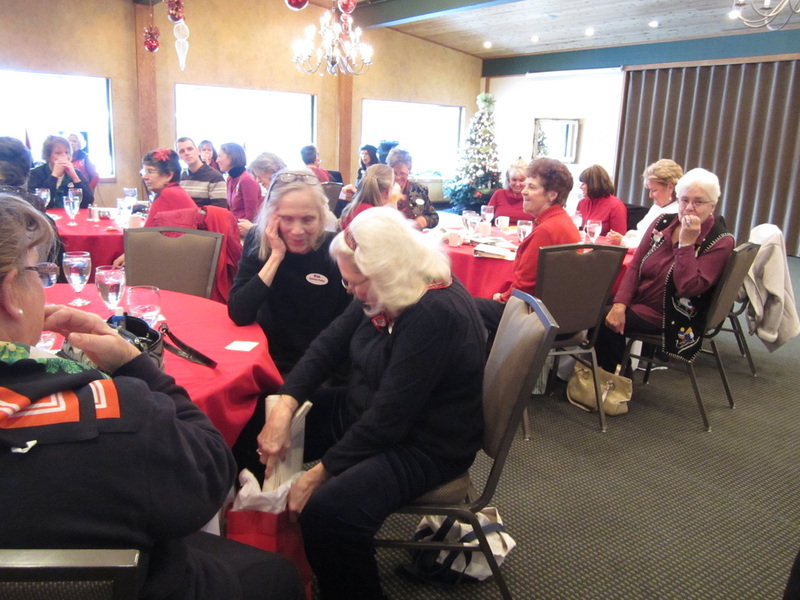 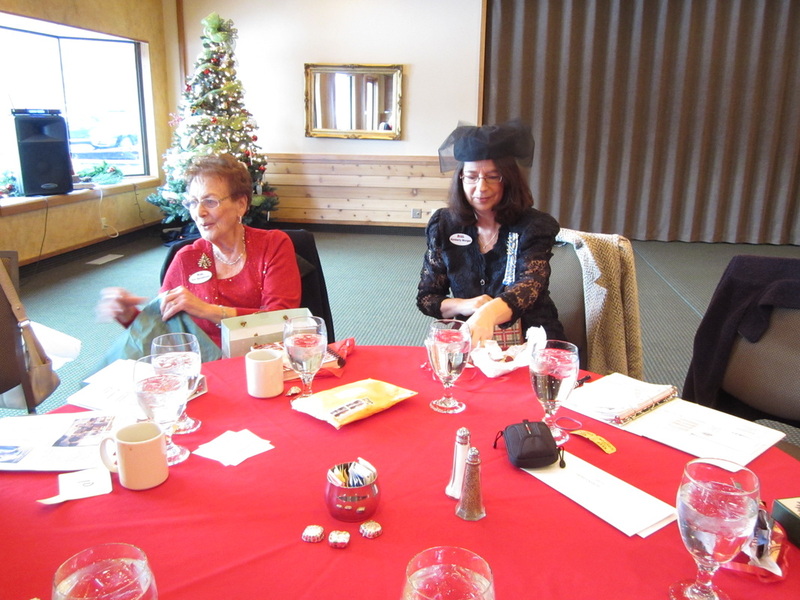 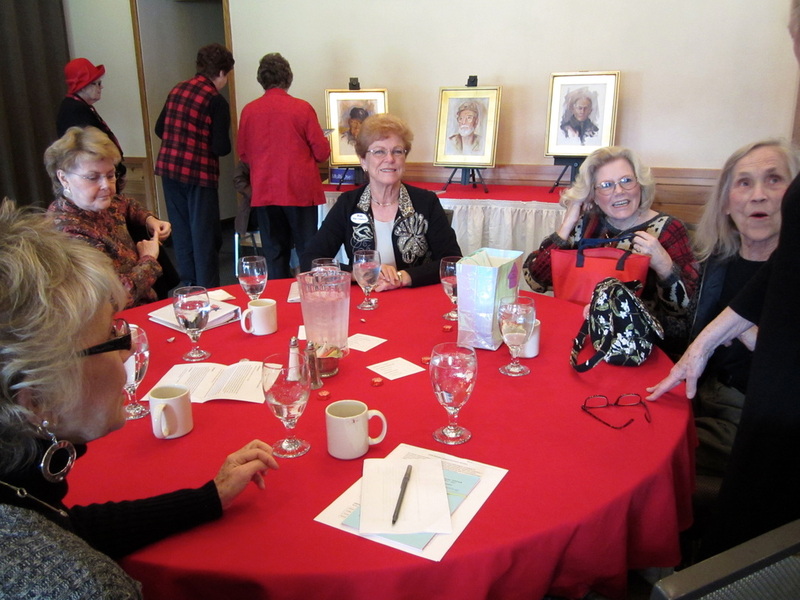 Lt. George Farragut Chapter ladies ventured north to Sandpoint for our March meeting. Preparations for State Conference are in full swing. 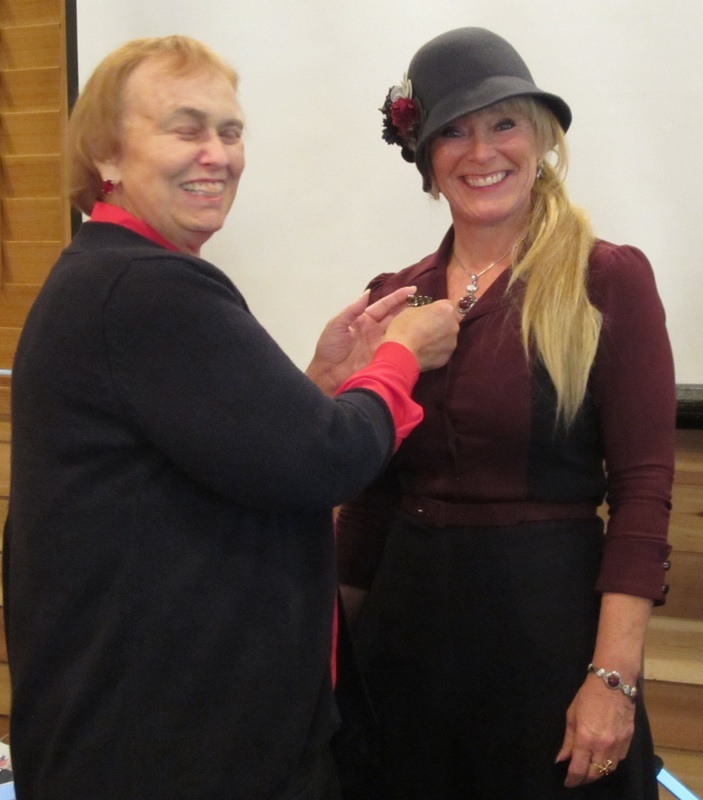 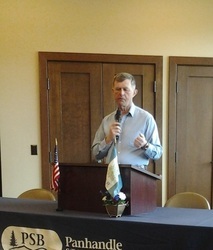 Local historian/journalist Sandy Compton shared the history of mining in North Idaho. 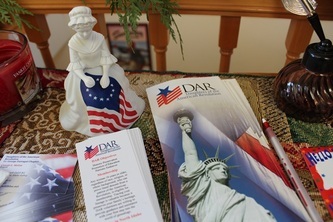 With Lt. George Farragut Chapter hosting the state conference in April, there has been much interest in DAR protocol. 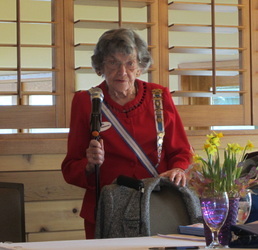 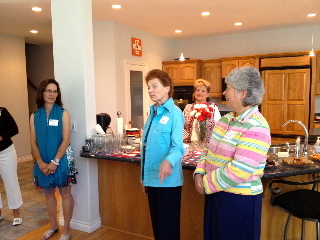 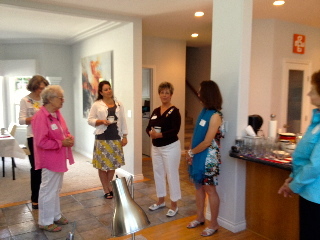 Founding member Helen Naslund shared with the group and answered questions from the floor. 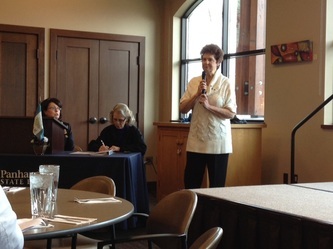 Regent Connie McGee answered questions about the conference. 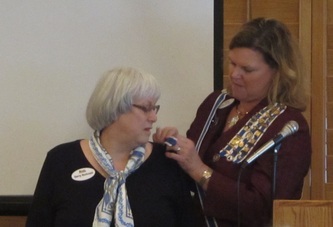 Sue E. was initiated as the 91st member of Lt. George Farragut Chapter in a ceremony led by Regent Connie McGee, Jeanne V. and Shelby H. with State Regent Liz Jones present. 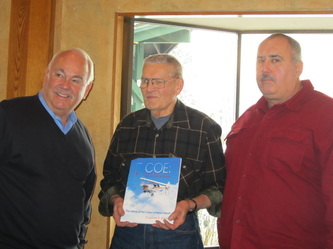 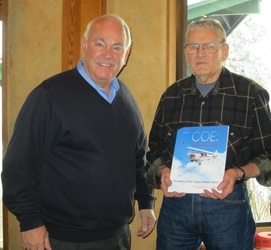 Gene Soper, author of COE: The FIrst Sixty Years shared stories and photos (many firsthand) of the old Coeur d'Alene airport at Weeks Field. 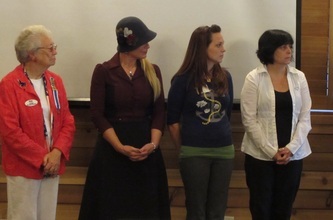 Ten HODARS joined us for the program, pictured below with their spouses. 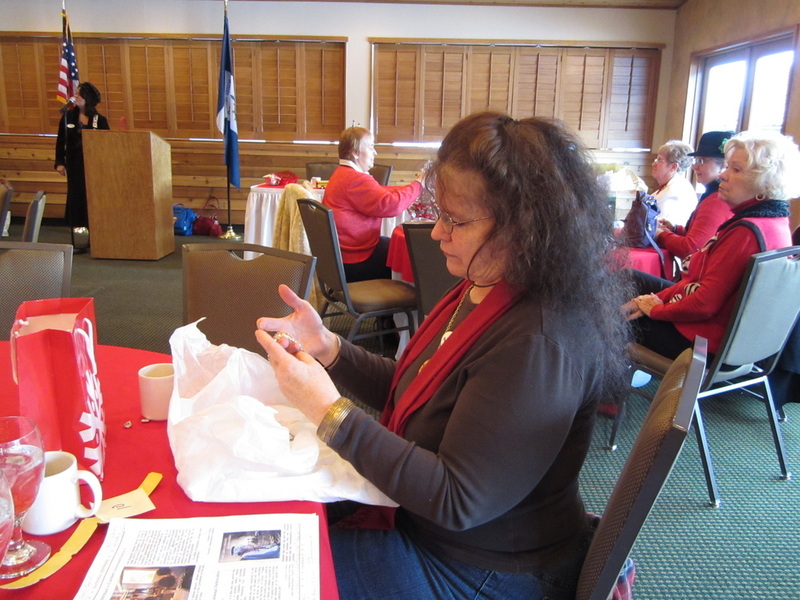 Lt. George Farragut members came out in the snow to meet and exchange gifts. 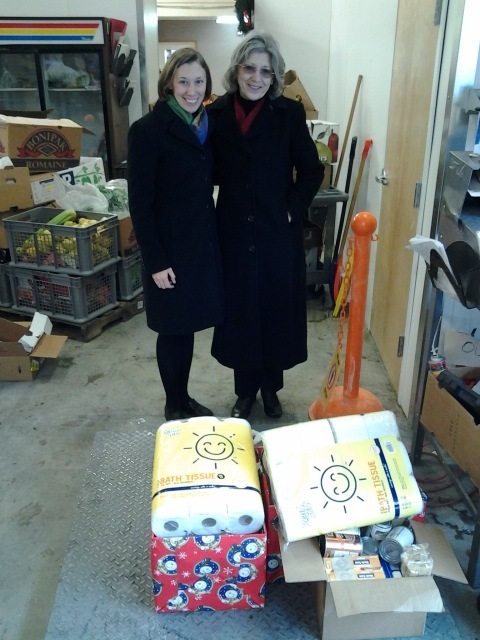 Donations collected for a local food bank were delivered after the meeting by chapter member Jo G. and her daughter. Voices were sold for a beautiful felt purse made by Regent Connie McGee. 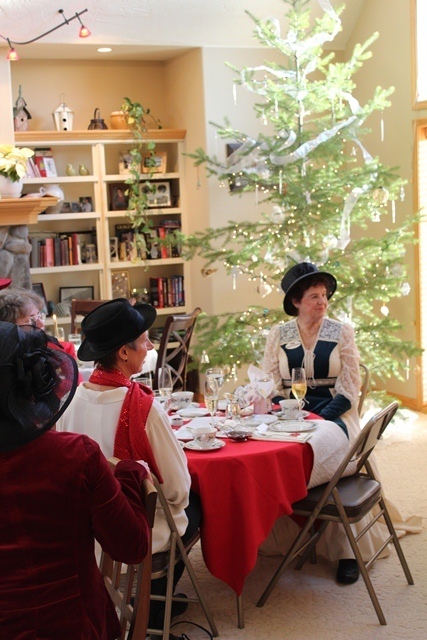 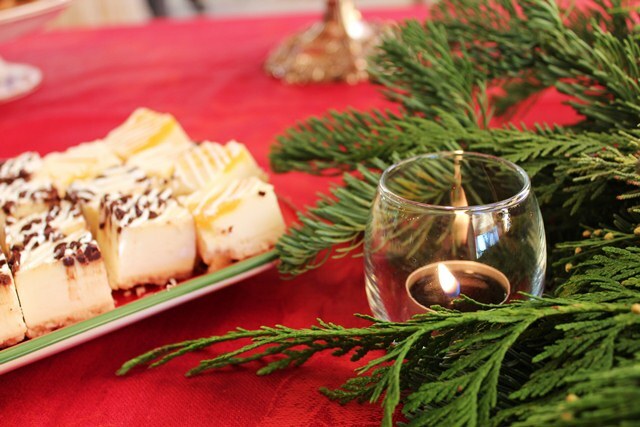 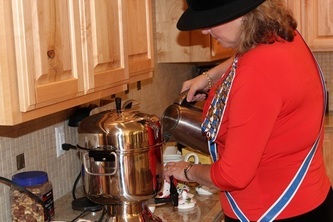 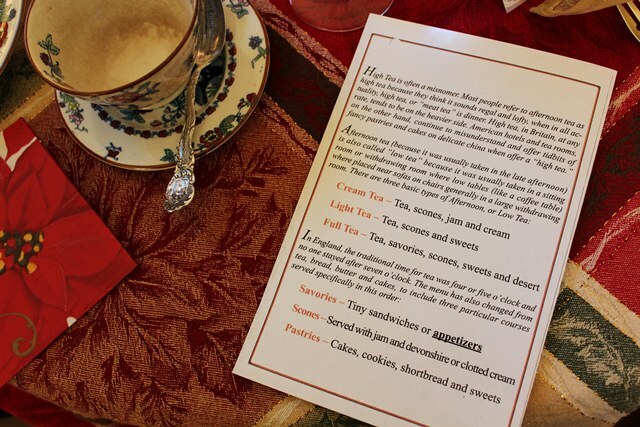 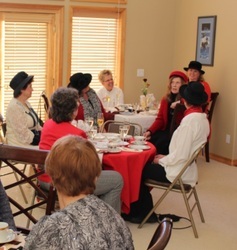 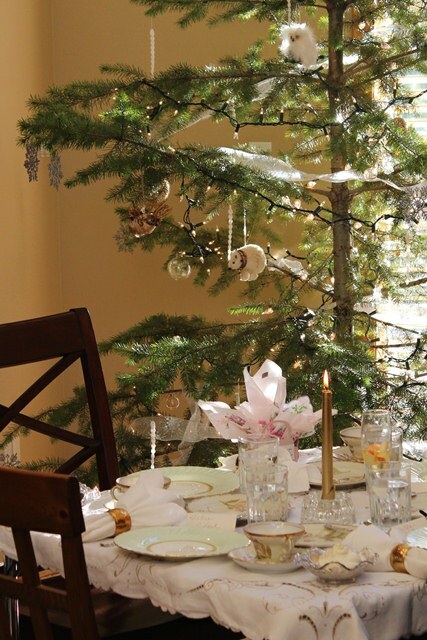 Lt. George Farragut DAR Chapter members hosted their first Prospective Members Holiday Tea at the home of Vice Regent Lora Gervais. 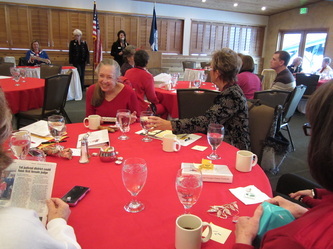 Eight prospective members and recent transfer members were present. 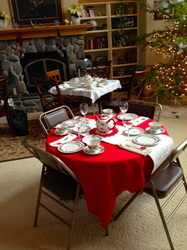 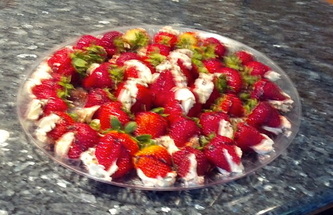 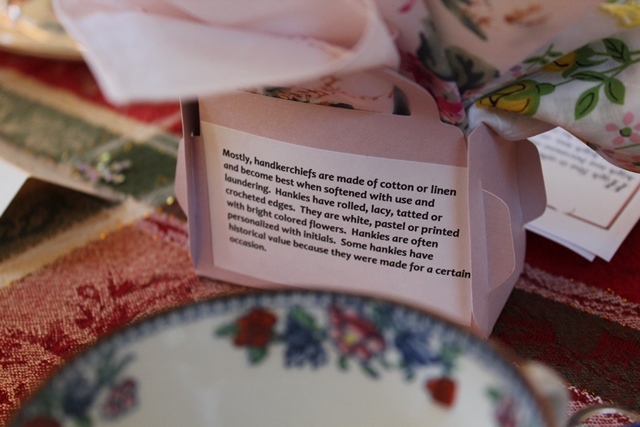 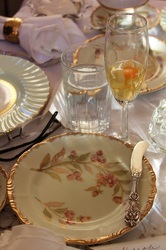 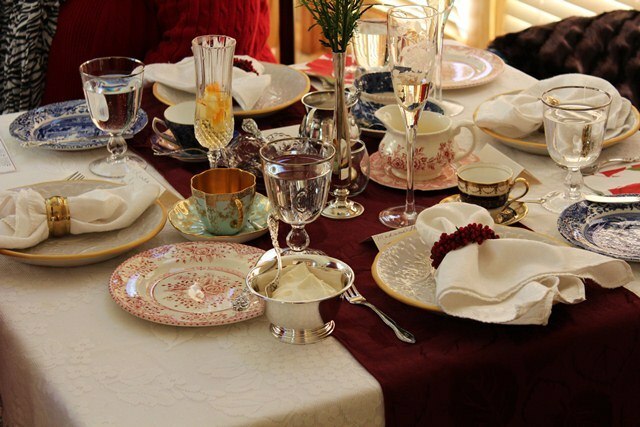 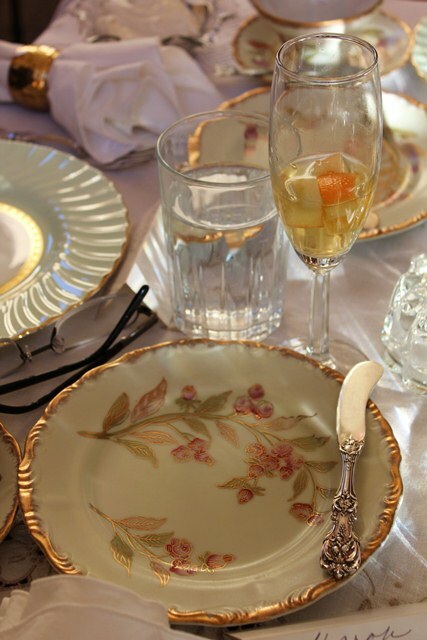 Scones, clotted cream, jam, teas, sandwiches, and sweet treats were enjoyed by all. 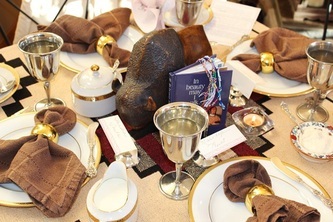 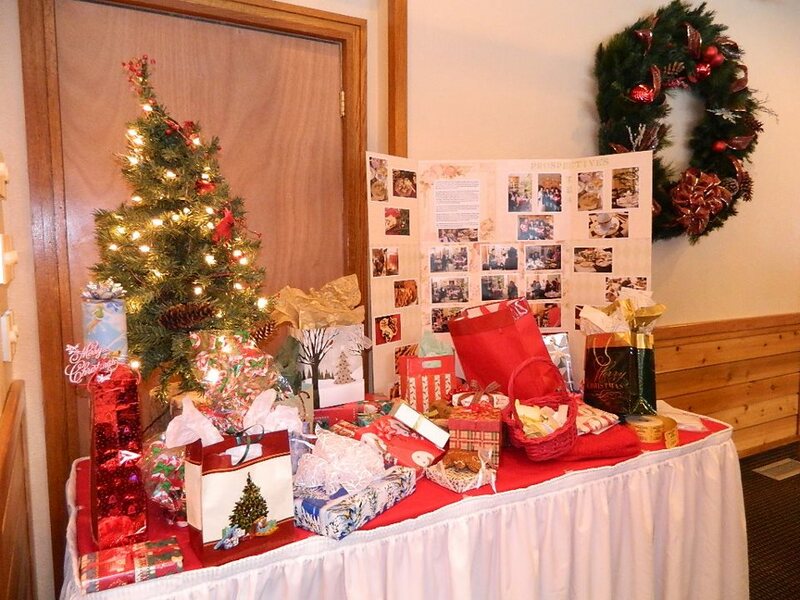 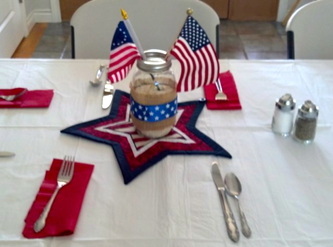 Individual tables were decorated utilizing a variety of themes and place settings. 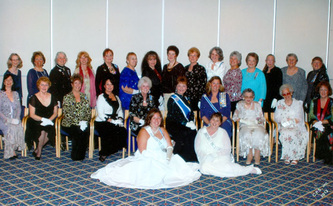 Chapter member Elena N. was the photographer for most of the photos below. 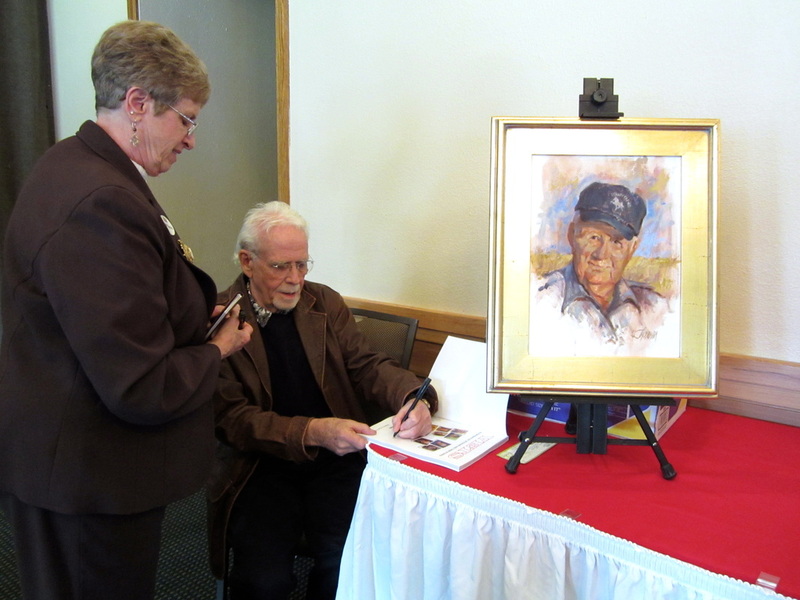 Portrait artist John Thamm and his wife Kathy shared portraits and stories from his book, 50 Portraits of Veterans and Their Stories. The book is a collection of portraits and stories of veterans spanning WWII to the war in Iraq. 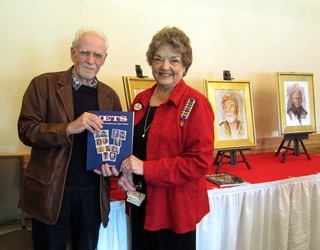 Thamm was happy to autograph books purchased at the meeting. 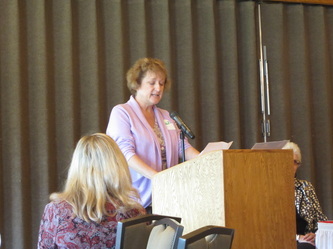 The chapter raised $240 for the DAR National Library through a Book Lovers Basket project hosted by Librarian Carol Waite. 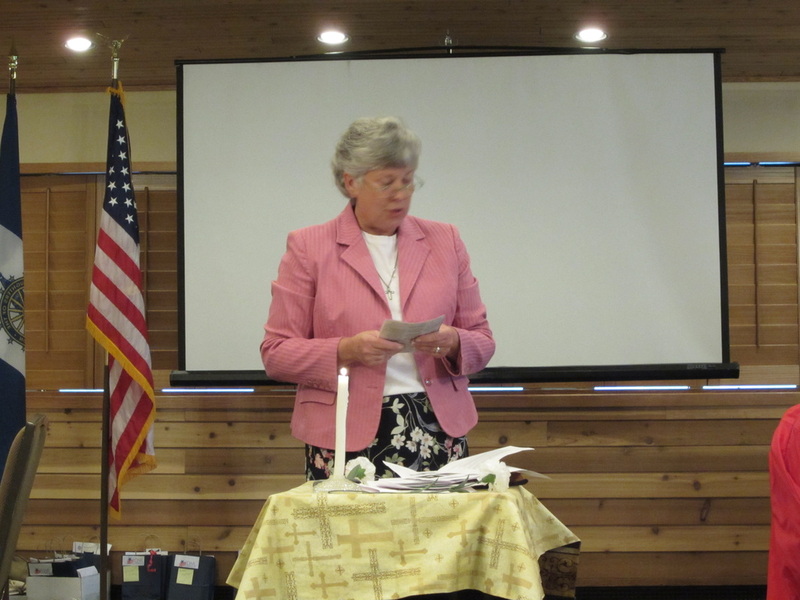 Chaplain Dorothy Benoit led a memorial service for two departed members: Bobbie Goodson and Genevieve Wolfe. 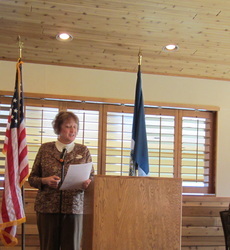 Regent Connie McGee presided over our meeting. 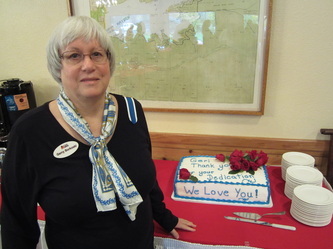 Three new members were inducted: Linnell B., Nichole M. and Susan W.. Geri Borkoski was honored for her service as regent with a Past Regent pin and a celebration cake. 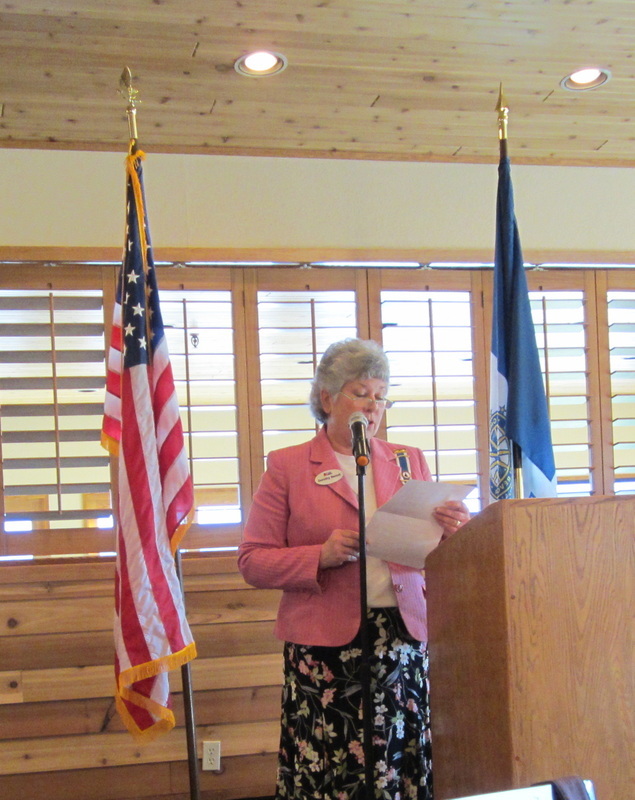 State Regent Elizabeth "Liz" Jones presented a program including a slide show from her trip to Continental Congress and National board meetings. 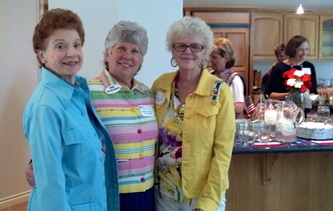 Nearly 50 chapter members and guests met for our first meeting of the 2012 - 2013 year. Regent Connie McGee led the meeting. 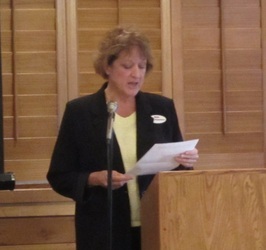 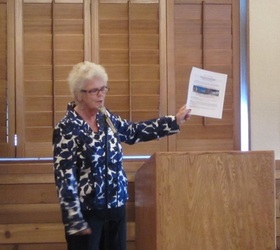 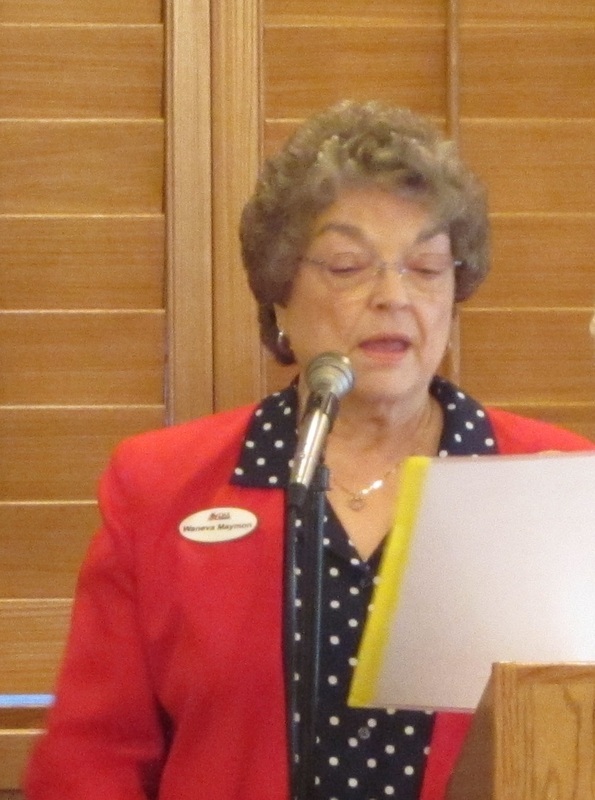 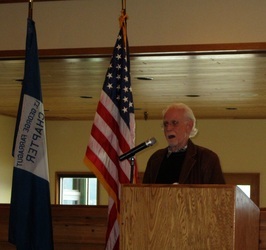 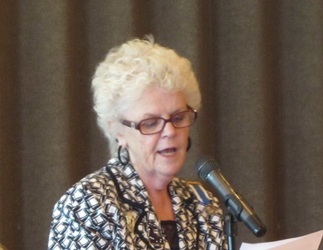 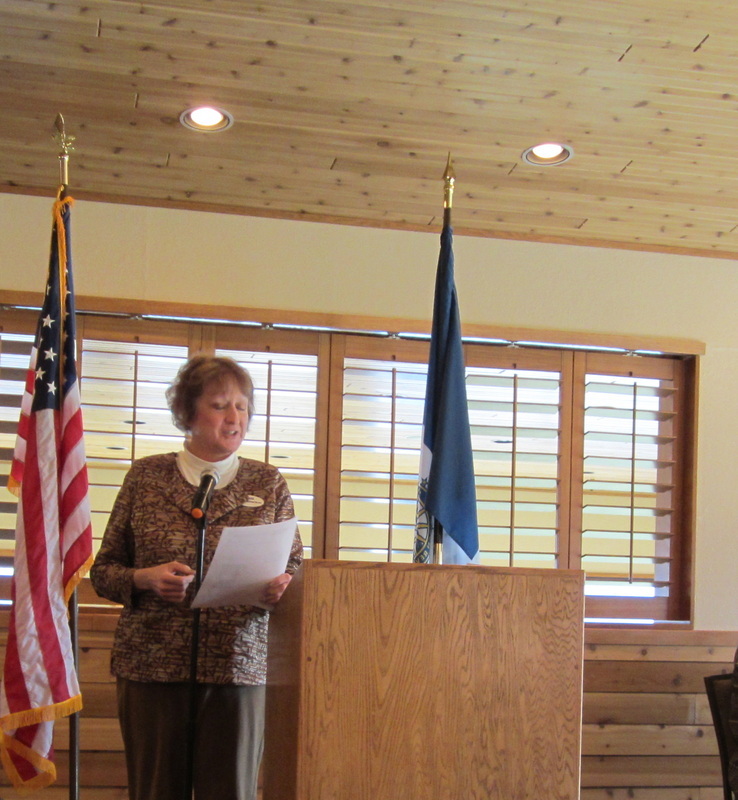 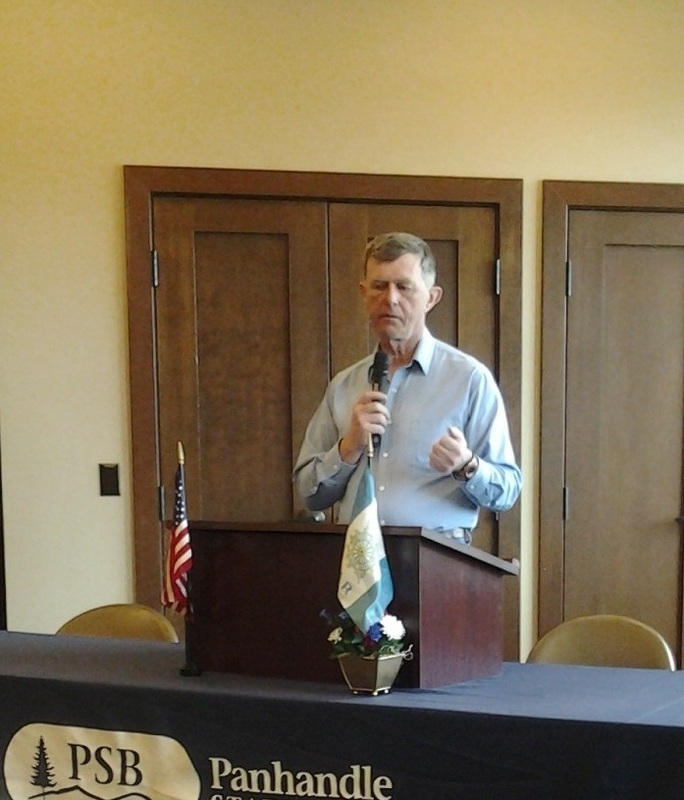 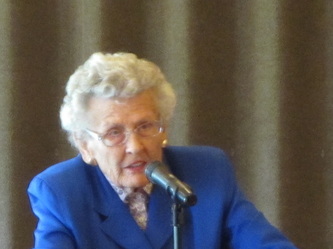 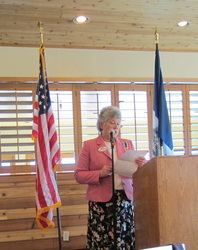 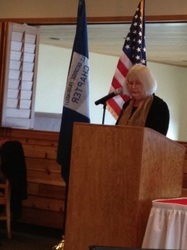 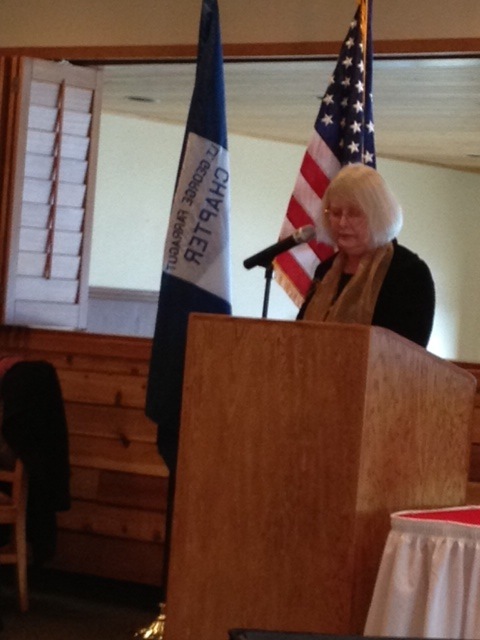 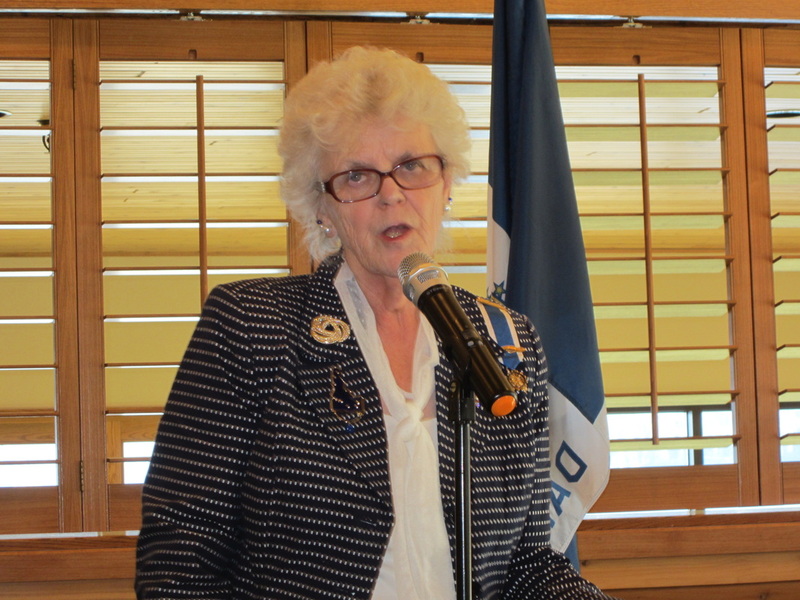 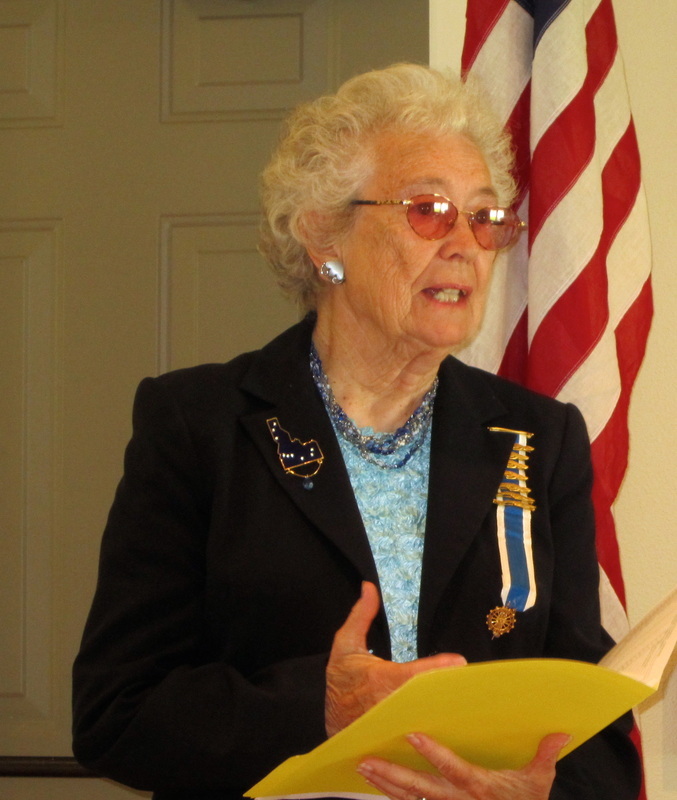 Betty (Rucker) Hulteng spoke on the history of the Hayden Lake Country Club. 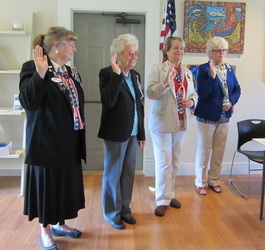 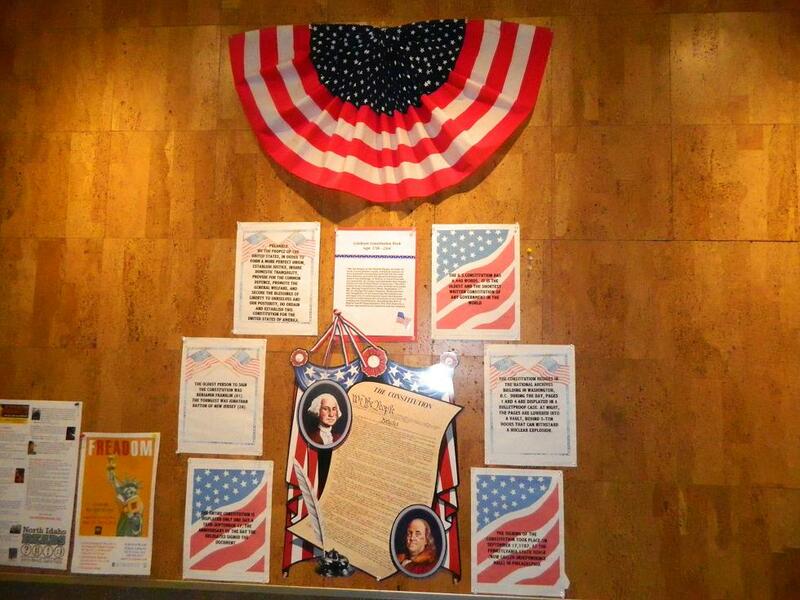 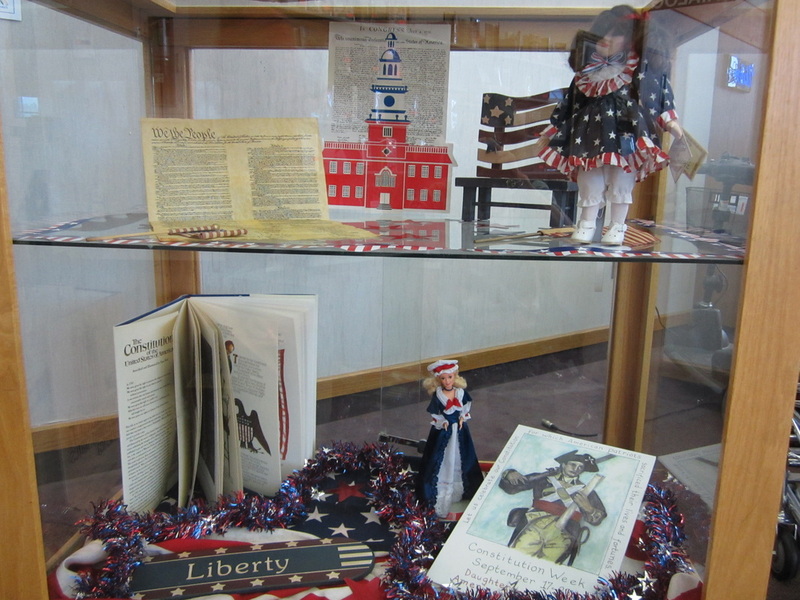 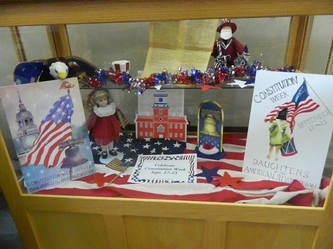 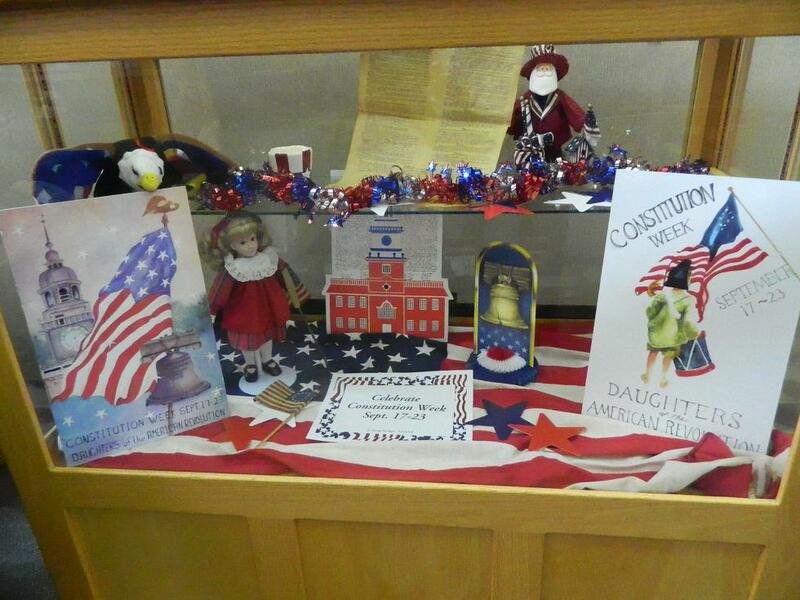 Three new members were inducted: Stephanie K., Deb W. and Andrea S.
Lt.George Farragut Chapter commemorated Constitution Week (September 17 - 23) with glass displays at the Hayden and Post Falls libraries, a wall display at Coeur d'Alene, and posters at Rathdrum, Athol and Spirit Lake libraries.